rejuvenate the body, quiet the mind, & nourish the soul. Spring classes begin week of April 1st 2019. 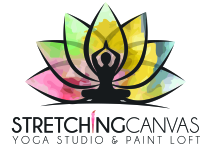 At Stretching Canvas, we offer yoga sessions you can purchase during each season. Choose to purchase a 1 class per week pass (valid for each season) or purchase an unlimited class pass per season where you can attend any or all yoga classes if you wish. We are Kripalu and Hatha yoga trained teachers (RYT 200hr) who love yoga, all it's benefits for body-mind-spirit, providing support, knowledge and gentle guidance in each class. We encourage students to attend classes from the beginning of each session to gain the full benefits of yoga. Drop in to any of our classes. Enjoy bringing strength and calm into your day any time you'd like. Visit our yoga page for a list of our weekly yoga classes. Mindfulness techniques, yoga stretches and breathwork will begin each session. We believe that connecting with our breath and body helps bring calm the mind and ground the body and observe our feelings so that we can delve into our creative work! Students will then learn about a master artist or delve into an intuitive painting, clay, fibre arts explorations each week and discover new techniques all while creating their own masterpiece and understanding themselves a little bit more through honouring their own style! Art Show & celebration will conclude on the final day!